Dickinson is a city in Stark County, North Dakota, United States. Get some historical perspective at South Unit and Painted Canyon Overlook. Step off the beaten path and head to Oxbow Overlook and Ukrainian Cultural Institute. 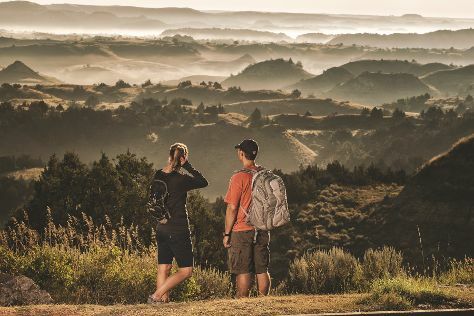 Change things up with these side-trips from Dickinson: Theodore Roosevelt National Park (North Unit, Peaceful Valley, & more), Medora (North Dakota Cowboy Hall of Fame, Theodore Roosevelt National Park, & more) and Enchanted Highway (in Regent). It doesn't end there: see the interesting displays at Dickinson Museum Center. For reviews, more things to do, photos, and other tourist information, read our Dickinson travel guide. Use the Route module to find suitable travel options from Eau Claire to Dickinson. Due to the time zone difference, you'll gain 1 hour traveling from Eau Claire to Dickinson. Traveling from Eau Claire in July, you can expect nighttime temperatures to be slightly colder in Dickinson, with lows of 56°F. Cap off your sightseeing on the 17th (Sun) early enough to travel back home.